6. Where has science in the national parks come from and where will it be going? 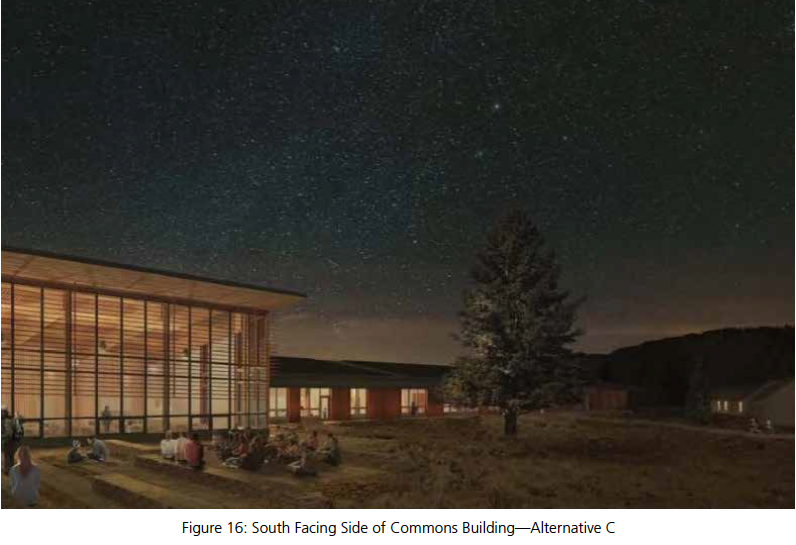 The Science for Parks, Parks for Science conference in Berkeley, March 25-27, 2015, took stock of the accomplishments of the past hundred years and pointed the way that national parks should take in the future. Scientists and budding scientists presented sessions, discussions, and posters about the work they have done and what is soon to come for the parks. Taking in any of the more than one hundred poster sessions on Thursday afternoon turned out to be impossible for me, but the conference program listed posters on such topics as invasive species, pollution, environmental planning, and engaging the public. Nearly a hundred short presentations took place concurrently on Friday morning in eight different rooms, meaning I could only attend a dozen of them in the three-and-one-half hours allotted. I chose to learn about light pollution—NPS scientists study this in some of today’s 407 discrete park units. Then I learned about what they’ve been doing since 1953 at the University of Wyoming / National Park Service Research Center in Grand Teton National Park. And I listened to the talks about analyzing visitors’ winter use of Yellowstone. Themes that resonate in my mind as I sum up the conference are (1) the importance of children’s gaining experience in the out-of-doors and (2) the efforts being made by many to engage the public, to encourage “citizen science.” Two of the many mentions of the first theme were when Interior Secretary Sally Jewell told us that the best classrooms are the ones without walls, and E. O. Wilson reminisced about his days of collecting insects and then snakes in southern Alabama. In connection with citizen science, speaker John Francis, the vice president for science of the National Geographic Society, titled his talk, “The World is a Park.” He told us how, since 2007, in eight different parks, students and community members have joined scientists for a 24-hour species count. These events have taken place from Rock Creek Park in Washington, D.C. to Golden Gate Park in San Francisco. This year’s event will take place in Hawai’i Volcanoes National Park on May 15 and 16. Participants age eight and over explore and inventory plants, animals, birds, fungi, fish, and any other organisms they find that make up a park. Downloading the iNaturalist.org app will aid in documenting species. Then he drew arrows leading back from the third line to the others, showing how the model feeds back on itself. And he added the importance of peer reviewers to the scientific mix. Professor Beissinger also traced scientific development or the rise of science in the parks from 1916, when first NPS Director Stephen Mather invested in infrastructure (but not science) through George Wright’s assistance in establishing a wildlife division in 1928, to the 1941 decimation of all science in the parks due to World War II. But in 1963 a National Academy of Science report again stimulated research, and finally in 1999 Cooperative Ecosystem Study Units were established in several universities, with the beginning of inventory and monitoring programs soon after. Beissinger reminded us of suggestions made by other speakers as to how to steward the parks through the inevitable changes they face. Pointing out that we cannot wait for today’s fourth graders to grow up and vote wisely, he joked that perhaps we could engage with some of today’s voters by having a “Tea Party Day”: give such voters free park passes and perhaps a crumpet for each! And the conference was over. Do you know how some people can stand up in front of a group and immediately grab everyone’s attention? You just know s/he will have something interesting and important to say. You sense that this is someone who spends time pondering big ideas. Being more of a mountain person than an ocean person, I had not previously given much thought or attention to the seas—but she certainly has. Although Ms. Lubchenco was brought up and went to college closer to mountains (in Denver and Colorado Springs), she was turned on to marine biology by a summer program at Woods Hole, Massachusetts, and went on to receive a master’s degree in zoology at the University of Washington and a Harvard PhD in marine ecology. Beginning in 1977 she and her husband, Dr. Bruce Menge, shared a unique arrangement: Oregon State University (Corvallis) allowed them to split a single position into two half-time but tenure-track positions, thus giving them both time for family duties. Dr. Lubchenco has won numerous awards for her research and teaching, served as president of the American Association for the Advancement of Science (AAAS) and from 2009 to 2013 was chief of the National Oceanic and Atmospheric Administration (NOAA). She is still Distinguished Professor of Zoology at Oregon State. 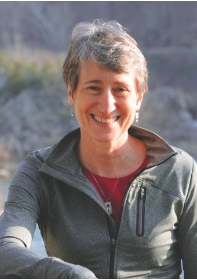 Her excellent lecture—scroll down to: Mission of the National Park Service and Its Relevancy Today (Part 2)—gives listeners a clear idea of how she has achieved so much. Beginning by telling us that only 6% of U.S. territorial waters and less than 1% of international waters are protected, she explained that there are two types of protection but that only Marine Reserves (and not the so-called Marine Protected Areas) are truly effective. Scientists have determined that 20-30% of the oceans need this protection, yet there is little public awareness of the need. A glimmer of hope appeared last summer, when President Obama set aside the Pacific Remote Islands Marine National Monument. Now is the time for countries to create “blue parks,” our speaker suggests, to complement the many green and brown spaces we have. Oceans are already 30% more acidic than at the beginning of the Industrial Revolution. A radical but valuable proposal is to close the high seas (all non-territorial ocean areas) to all fishing; she explained how this would actually benefit protected areas and fishermen. Dr. Lubchenco ended her observations with a story illustrating another point she wanted to stress. While briefing Vice President Joe Biden as they flew together to view the devastation and talk to people after the 2010 Gulf Oil spill, she told him among other things how some fish and seafood can metabolize the chemicals in oil and some—such as oysters—cannot. Listening for a while, Biden said, “I thought you were a scientist.” “I am,” she said. “But I just understood everything you told me,” replied Biden. Scientists must learn to tell stories, concluded our speaker, to be “bilingual,” that is, to talk both in science-speak and in everyday language, in order to engage the public. What to say about an idyllic three days in the Lamar Valley enjoying and learning more about Yellowstone wildflowers? Even in seasons without so many flowers the valley is one of my favorite places anywhere. Whenever I’m there, I can never get enough of the changing light as you look up the valley to Saddle Mountain and its neighboring peaks or across the river to Specimen Ridge. But this green early summer with bison grazing everywhere is really special. Also special in every way was the Yellowstone Institute class called The Art of Wildflower Identification. Instructor Meredith Campbell is not just knowledgeable about botany and a fine artist. 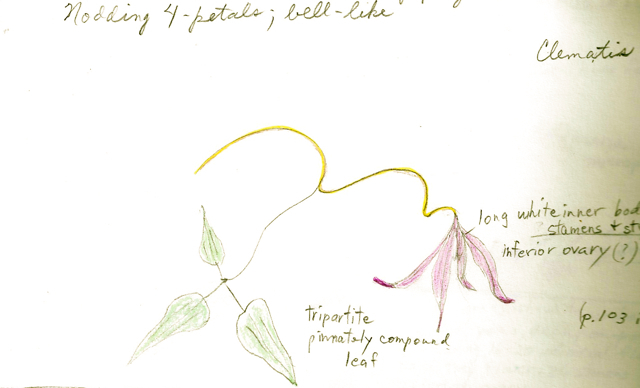 She is wonderfully qualified to patiently teach us about keying in Rocky Mountain wildflowers as well as about some techniques of drawing and using color. We were using a little booklet that asks us specific questions about the leaves and flowers and (sometimes!) leads us to identify the one we are looking at. This was my third time for taking this class, but the second was seven years ago, and I need lots of review. Special for me this year were the other members of the class, who included the current Mammoth Clinic doctor (also trained as an architect and capable of lovely flower drawings), several caring people who work for the park service or for the Yellowstone Association, and others with interesting backgrounds and reasons for being there. They were particularly kind to me as by far the oldest class member. It hardly mattered that it rained on and off for the first two days and the third was sunny—but when we went partway up Mt. Washburn seeking subalpine flowers, we encountered a strong cold wind. You never know what to expect in the mountains. I am hoping I can soon add a Lamar Valley picture to this post, one taken by Kathie Lynch, who spends so much time studying Lamar wolves that her license plate is “YNP WOLF.” She writes interesting reports about the park’s wolves on The Wildlife News. In a few days I’ll fly to Idaho Falls for a brief visit with a friend before I drive to the Lamar Buffalo Ranch in northeastern Yellowstone for my Yellowstone Institute class. 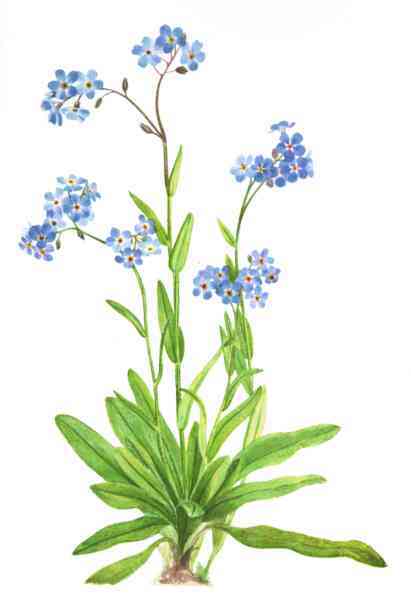 This is a class called The Art of Wildflower Identification, taught by Meredith Campbell. I’ve taken the class twice before and simply loved it. We start with the elementary botany of flowers, and since for me it’s always quite a few years between these classes, I can use all the review I can get. Meredith also shows us some techniques for drawing with our colored pencils. Then we’re off for three days in various outstanding fields of flowers that she’s found in advance. You can see why I need more classes!